2015 repress; originally released in 2013. "In the face of the ever-worsening status quo of watered-down and vapid radio rap songs, the call for something real has only gotten stronger, and once again the time is right for a call to action -- for someone or something to come in and send wack rappers running for the hills in fear. 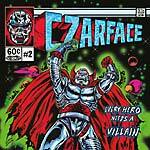 Enter Czarface, the uncompromising full-length album from Inspectah Deck and 7L & Esoteric. 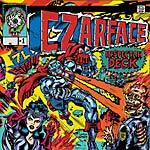 Not surprising, respect for real hip-hop runs deep, and Czarface brings an army with it -- consider the star-studded guest list which includes Roc Marciano, Action Bronson, Vinnie Paz (Jedi Mind Tricks), Oh No (Gangrene), Mr. MFN eXquire and Deck's fellow Wu-Tang Clansmen Ghostface Killah and Cappadonna."